igus® has introduced a universal plain bearing material that helps prevent the build-up of electrostatic charges. 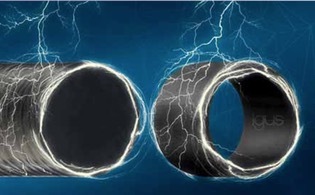 Being electrically conductive, any electrostatic charge is safely discharged avoiding sparking, and like all other iglidur® materials, the bearings are self- lubricating and require no maintenance. The ESD-compatible iglidur® F2 plain bearings are suitable for use in wet conditions, in addition to numerous applications including material handling, automation and electronics manufacturing. have a good resistance to chemicals and most lubricants. The universal bearings are currently available in two types, a cylindrical sleeve and with a flange, with six standard internal diameters and lengths ranging from 6mm to 20mm. Other standard sizes can be requested. Based in Northampton in the UK, and with global headquarters in Cologne, Germany, igus® is the largest producer of injection moulded polymer bearings and reinforced plastic cable carriers in the world. Product lines include industry- leading e-chain cable carriers, chainflex continuous-flexcables,iglidur® plastic plainbearings,igubal® sphericalbearings, drylin® linear bearings and guide systems. The company has 26 subsidiaries across 31 countries and employs more than 2,150 people worldwide.